Chicago’s antiquated commuter rail system has been in the news a lot lately, from its long-running patronage scandal that included the suicide (by one of his own trains) of one CEO and the resignation of another under political pressure to a rough performance during one of the worst winters in memory. Now, though, Metra is attempting to turn a corner, with a process underway for creating the agency’s first strategic plan, and long-overdue fare hikes planned to pay for a new capital plan. There are also structural barriers: Metra doesn’t own all of its tracks, and some carry freight trains that would interfere with frequent service. But even on the lines it does own — including South Chicago — Metra’s governance structure makes regional, big-picture planning difficult. Unlike GO Transit, which is run by the province of Ontario, a controlling share of Metra’s board is appointed by suburban officials, who have historically shown more interest in competing with the city for dollars than collaborating on a regional transit strategy. Paralyzed Metra may be. But it’s all the more sad, because the Chicago area actually has a rich set of assets that could make setting up the nation’s premier regional rail system a relative snap, certainly easier in degree of engineering difficulty than equivalent situations in Boston or New York. In short, advocates of turning “commuter” rail systems into “regional” rail argue for turning infrastructure currently used mainly for peak-hour commuting into rapid transit, with more-frequent service across a greater span of time. Imagine trains coming on your local Metra line every 10-15 minutes throughout the day. Chicago has long been recognized as having unequalled assets for such an approach; although many of Metra’s lines do, as Daniel pointed out, share tracks with long, slow freight trains, there are several that do not; the Chicago Metropolitan Agency for Planning’s map of freight trains per day in the city area is a very useful asset for envisioning this. 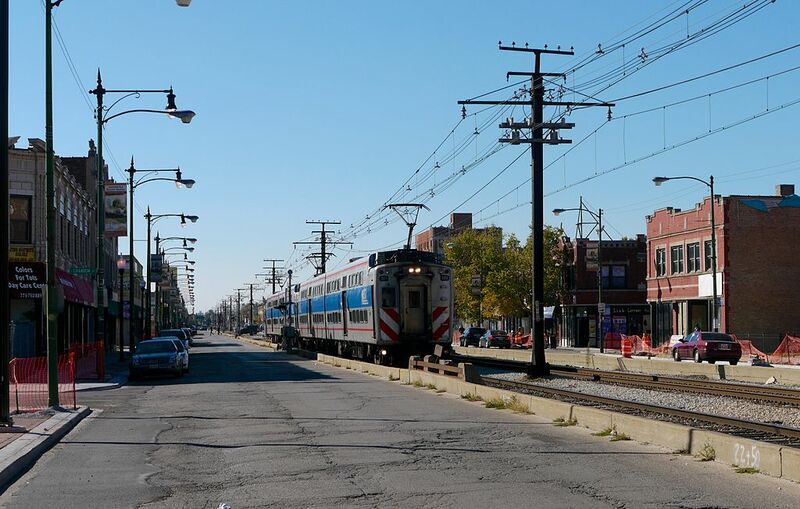 The line currently known as the Metra Electric District has attracted the most attention in terms of rapid transitization, and for good reason. The passenger tracks are fully separate from freight tracks; there are at least four tracks for passenger trains all the way out to 111th Street; the line is already fully equipped with high-level platforms, a necessity for getting people on and off the train quickly; and within the city of Chicago MED runs through poor, mainly African-American neighborhoods with poor transit access. Plans for turning the MED (usually the mainline as far as 67th and then the South Chicago branch) into a rapid-transit operation have come from various sources, including the amateur, the governmental, the academic, and the advocacy world. Most recently, a rapid-transitized MED has been incorporated into Transit Future and into the Midwest High Speed Rail Association’s plan for a CrossRail Chicago. The latter plan brings in the element of using the St. Charles Air Line and a new bridge to connect the MED to Chicago Union Station. From there, trains would use renovated platforms on CUS’ two run-through tracks and proceed over newly-electrified tracks currently serving Milwaukee District-West and North Central Service trains to a connection with the O’Hare Airport People Mover. These proposals are a useful starting point for envisioning the future of Metra, the last one in particular. Though excessively focused on the needs of white-collar Chicago (promotional literature touts it linking “O’Hare to the Loop, McCormick Place and the University of Chicago”), the CrossRail Chicago proposal shows a kind of vision—moving large numbers of people across a very large city, rather than forcing them to transfer or otherwise navigate the congestion of the Loop—that a full-scale Regional Rail system would need. Though the benefits of through-running trains through downtown Chicago itself may not be great, it is operationally easier than using the numerous dead-end terminals that currently plague Chicago, and does open many potential crosstown commutes. And though I’d rather see a tunnel under the Loop to connect MED to the rest of the system in the long run, using the SCAL and CUS run-through tracks is significantly more realistic in the short term. That being said, I’m not convinced that the CrossRail proposal is the best place to start. It would involve electrifying some tracks that are shared with freight trains; the MD-W right-of-way varies between 3 and 4 tracks wide, and reconstructing the line for electrification, fully separating freight and passenger traffic, and installing high-level platforms, while doable, would be fairly expensive. There are two other North Side Metra lines that are entirely or nearly entirely freight-free, UP-N and UP-NW; why not start with them? way of linking the CUS approach to the tracks that once led to the C&NW Navy Pier Branch, which could be (with some work) re-purposed to carry trains up to the UP lines. Altogether, there are enough challenges with the UP-N line that it’s not the lowest-hanging fruit for North Side regional rail. That title, in my opinion, falls to its sister operation, the UP-NW line. It checks off all the boxes. Zero freight traffic? Check. More than two tracks? There are three or more, meaning one could be reserved for peak-hour diesel expresses. Currently runs through an area in need of rapid transit? Once it leaves the path of the Blue Line at Jefferson Park, certainly. Transit-supportive land use? The neighborhoods and towns along UP-NW aren’t as dense as most of the North Side closer to the lake, but they were originally railroad suburbs, and retain a decent degree of walkability. There’s even an opportunity for supporting local bus service, with Northwest Highway running parallel to the tracks. I would argue that UP-NW is the natural Phase 1 North Side partner for a regional rail system incorporating MED and CUS run-through tracks. 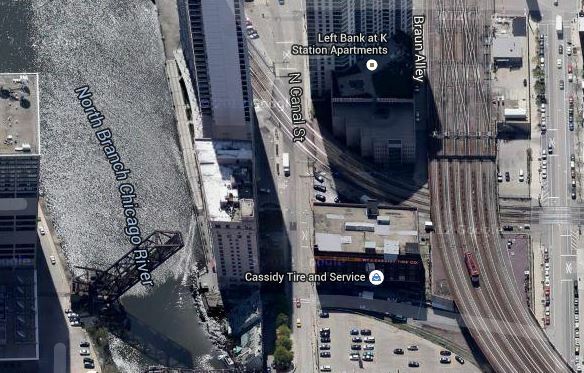 There are, in fact, two options for connecting CUS to UP-NW; one is a direct connection via the aforementioned demolition of the Cassidy Tire building; the other involves sending trains first west and then north on tracks used by Milwaukee District-North trains to Mayfair (adjacent to Montrose Blue Line station) where they’re rejoin the UP tracks. I favor the second approach for two reasons: 1) with the provision of several infill stations, it holds the promise of bringing rapid transit service to an area of the city currently without it, whereas UP-NW runs mostly parallel to the Blue Line and 2) it would begin the infrastructure work for a Phase 2 buildout of the O’Hare branch. There are challenges; the line is only double-tracked in parts, and it does host occasional freight, so clearances for infill stations might be an issue. But I think these are much more manageable than the challenges on other lines. Time for some maps? I think so. 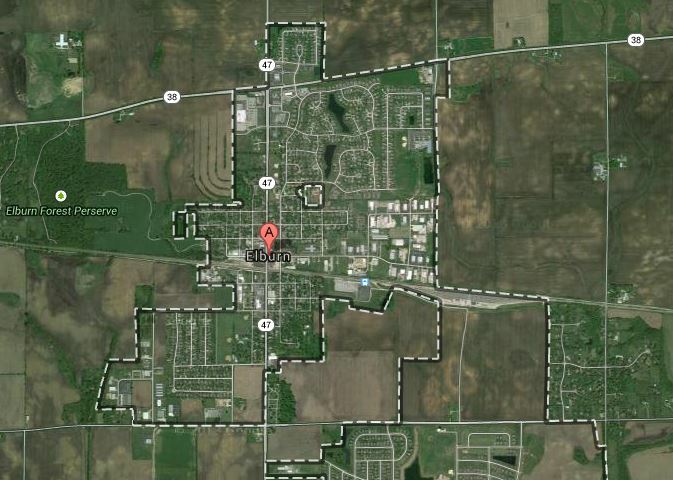 Here’s my proposal in Google Maps. Toggle through the three layers (button at upper left) to see what I’m proposing for phases 1 and 2; I’ve also included an expanded version of the Mid-City Transitway concept, a more elaborate project that I think would be crucial to any future re-orientation of the Chicago transit system away from its Loop-Centrism, but which I’m not discussing here. Institution of rapid-transit style service on Metra Electric at least as far as 111th Street. Blue Island and South Chicago branches to be run as shuttles, with South Chicago probably having direct service to Randolph Street at peak hours. MED-CUS connection via St. Charles Air Line and a new bridge over the Chicago River, including a new infill station in the South Loop, possibly with L connections (this is the most expensive part of the whole project). New Northwest Rapid Transit Line, including electrification and high-level platforms via MD-N tracks to Mayfair and UP-NW to Des Plaines or beyond (Arlington Heights is a possible terminus). Service pattern would be through trains from Des Plaines to 111th Street. Expresses from suburbs would continue to downtown stub-end terminals. Reconstruction of UP-N with three tracks and high-level platforms as far as Evanston; demolition of Cassidy Tire building to provide direct access to CUS. Reconstruction of MD-W and NCS tracks, including isolation of passenger service from freight as far as Franklin Park, electrification, and high-level platforms. Service patterns could take any number of forms, with three northern and three southern termini. At this point, with three lines feeding in from the north, and a large amount of traffic from the south, the poor two run-through tracks at CUS would probably be verging on a capacity breakdown, so this seems like a logical place to stop. How much would this plan transform Chicago? 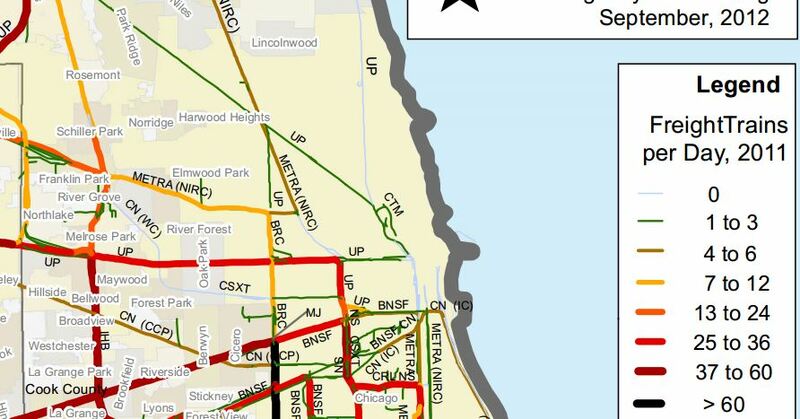 Well, it could provide easier commutes for thousands on North Siders to the South Loop, Hyde Park, and the like; and it would likely make service jobs on the North Side more accessible to disadvantaged South Side communities. It would also mean expensive L expansions like the Red Line extension to Roseland aren’t necessary; indeed, I think it’s likely that both initial phases could be completed within the anticipated budget of the Red Line extension. That being said, dollar-for-dollar Chicago’s best transit investments probably lie in improving bus service, whether that’s re-prioritizing local buses or a transformative bus rapid transit system. A rapid-transit conversion of these lines, though, is low-hanging fruit; it’s cheap, easy, and could be very quick. The essential problems, as always, are political. Metra’s skewed, paralyzed governance structure would need to be convinced to go along with a project that primarily benefits city-based riders. Transit unions would need to accept one-person operation of trains on the new service for it to be affordable–a common practice in Europe, but one an insurmountable barrier in the US thus far. In many ways, though, I think that building political momentum for this kind of a system could be easier than improving Chicago’s buses; it’s a cost-effective fix that doesn’t involve taking road space away from drivers or investing in (much) fancy, expensive new infrastructure. Let’s get Metra moving. Other than the SCAL-CUS connection, the most expensive part of this plan would likely be buying rolling stock. Metra’s new MED gallery cars, identical in most respects to the ones in operation on the diesel lines, have only one set of central doors–not ideal for rapid-transit operations. The “other” low-hanging fruit on the Metra system for rapid-transitization is the Rock Island district; I think it’s a lower priority because it runs parallel to the Red and Green Lines for much of its length. It’s possible future target for this kind of conversion, though. There’s a long-running dispute in the transit and planning world about the relationship of commuter rail to land use. Does commuter rail to suburban and exurban areas damage the environment by enabling sprawl, or help preserve it by taking long car trips off the road? It can be hard to tease out correlation from causation in these circumstances. Over the last several decades, commuter rail systems in the nation’s major metropolitan areas have spread ever-deeper into the suburbs and exurbs, propelled by powerful suburban politicians who crave the glory of being seen as “relieving congestion” (one thing that almost anyone can agree American-style commuter rail can’t do). But does commuter rail being built to a sprawly area (like, say, Elburn, IL) make that area’s growth possible, or would the growth occur anyhow, with the potential rail riders simply driving to work? 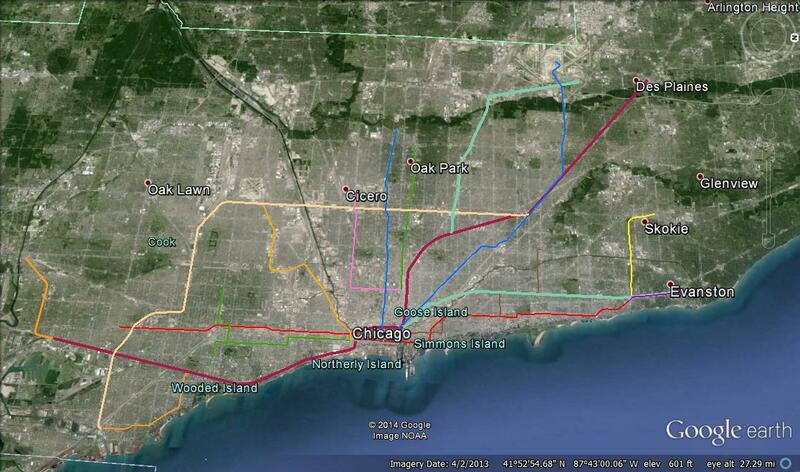 Commuter rail to sprawlsville: the western terminus of Metra’s UP-W line. Commuter rail has, for better or for worse, been an increasingly popular mode over the last several decades, so figuring out which way the dependency goes has been hard; there are plenty of areas that are sprawly without the benefit of commuter rail, but few that have actually lost service since the modern era of commuter rail (defined roughly as the takeover of bankrupt private services by government corporations in the ’70s and ’80s) began. Identifying such an area would allow us to determine whether the loss of service arrested growth, forcing it into a more compact area, or whether growth continued unabated, with commuters switching to cars. There is one rather infamous example of such a loss of service–SEPTA’s former diesel operations. When SEPTA took over responsibility for the Philadelphia-area regional rail system (first through subsidies paid to the operating freight railroads, then directly) it inherited not only the core electrified services of the former Pennsylvania and Reading networks but several diesel-operated semi-intercity services, extending to Newark, NJ, Bethlehem and Allentown, and Pottsville/Reading. The two all-Pennsylvania branches, in particular, essentially served as extended commuter services for riders to downtown Philadelphia. By 1981, amidst a funding crisis and apparent apathy from SEPTA, service had ended on all three extended routes (diesel service remained for two more years on the shorter Newtown-Fox Chase branch). 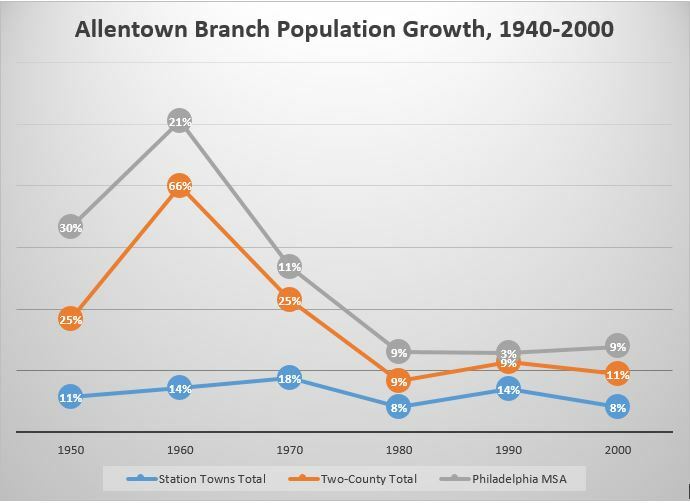 If the elimination of SEPTA’s diesel service had impacted suburban growth along the line, we would expect growth in those towns to fall during the ’80s. Instead, the towns as a total grew by 14%–11% more than the Philadelphia MSA as a whole, and 5% more than their containing counties. Growth fell a little below regional trends in the ’90s, but almost indistinguishably. Over the 60 years I examined, growth in the station towns either matched regional trends or was actually slower. It’s hard to argue from this data that there’s any correlation between the presence/absence of commuter rail service in a particular town and its growth. There is both good and bad news for transit advocates in this (admittedly unsurprising) conclusion. On the one hand, that suburban sprawl can continue without transit means that advocates and agencies should feel free to resist the loud calls for expensive (in terms of both capital and operations) outward extensions from exurban politicians and commuters. On the other, growth will probably continue regardless of transit, so why not try to get people out of their cars? I haven’t seen extensive data from SEPTA’s Regional Rail operations in the wake of the diesel service eliminations, but the overall fall in ridership suggests that commuters from the areas that lost service chose not to drive to closer-in termini, but to drive all the way to Center City. Should we build commuter rail to sprawl? On the whole, I think there are (as always) much higher priorities for transportation funding (and government funds in general). Commuter rail as currently conceived in the US is really expensive to operate, and sending it out to the far reaches of a metropolitan area is essentially a favor to exurban commuters and a subsidy for bad regional planning. But if the funds are available (and can’t be spent on anything better) and if suburban towns are willing to shape their land-use decisions (at least in the immediate station area) around transit, I suppose some service is better than none. Either way, if the Allentown Branch case is even remotely representative, it’s pretty clear that while commuter rail might be a subsidy for sprawlers, it isn’t actually a cause of new sprawl. Though I don’t live in Chicago anymore, I still prize WBEZ’s Curious City, a series of in-depth research segments on questions submitted by listeners about Chicago and what goes on it. Generally, they do a pretty good job for non-specialists. That’s why it was particularly disappointing to read the segment from last week about bus bunching that essentially treated bunching phenomenon as inevitable, and somehow completely failed to consider the possibility of dedicating lanes to transit! What was really disappointing about the Curious City piece is that everyone interviewed–from bus riders to academics to CTA drivers and officials–seemed to take the the fatalistic attitude that bus bunching is completely inevitable and very little can be done to prevent it. And in the current, auto-centric paradigm, that may very well be true. But it ignores the fundamental truth that, as with many elements of our transportation system, Chicago’s operation of a transit system prone to bus bunching is fundamentally a political choice. There is, in fact, one policy lever that can help the CTA (and other agencies) avoid bus bunching, but it is politically unpalatable to most actors, especially the city’s auto-oriented elite: dedicating lanes to public transit. And I have to say, unlikely as it is that the populace of Chicago will suddenly have a massive change of heart and decide that it’s worth dedicating lanes to transit across much of the city, it was irresponsible of Curious City not to even include the possibility of dedicated lanes in their report on bus bunching. True, no dedicated right-of-way can truly eliminate bunching, but buses having a clear path removes most of the obstacles that can lead to bad spacing. A majority of the space on the public thoroughfare is set aside for the use of cars. And even though particular interventions—a bike lane here, a storage rack there—are certainly debated, nobody even begins to address this issue from a standpoint of first principles. Why would a city like Washington (or New York), most of whose residents don’t commute to work in a car on a daily basis, want to allocate its space in that manner? It’s not impossible to come up with an answer. Perhaps the view is that automobile driving is associated with positive social externalities such that at the margin we want to encourage people to drive more and walk less. Or perhaps the view is that the goal of urban policy is not to maximize the welfare of city dwellers but instead to maximize the wealth of downtown landowners by facilitating suburbanites’ commutes. But there’s no explicit articulation of this view. Is a network of bus-only lanes (whether it goes by the appellation “Bus Rapid Transit” or not) feasible in Chicago? Certainly, in the right corridors giving street space to buses can mean better flow of people, even if cars end up moving more slowly, and reallocation of street space is way more cost-effective than, say, subways. Chicago might be a challenging case, however. Chicago’s arterial roads are actually fairly narrow, at four to six lanes (including parking), meaning that dedicating lanes to transit for long stretches means either removal of all parking or taking away half of the lanes available to drivers–something that I might not be opposed to, but that might mean taking more road space than existing transit services can justify. 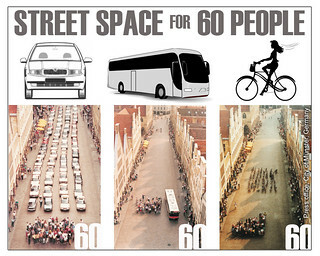 But there are places where dedicating more road space to transit is feasible and arguably the only moral choice. Take North Lake Shore Drive. With plans for the future of that roadway currently being made, its eight lanes carry 161,000 cars and 69,000 bus riders on the various express routes that use it every weekday. That means just about 30% of travelers on the Drive (or a little lower if we adjust for some cars carrying more than one person) ride transit. Surely the new Drive could spare one lane in each direction (25% of road space) to accommodate these users? When the issue of bus bunching came up a couple of years ago Shaun Jacobsen wrote a useful post on the issue from a Chicago perspective. He suggests that while dedicated lanes may not be feasible across the network, there are particular choke points that delay buses where they might work. As a former rider of the 49 Western, I know I could suggest a few intersections where banning parking in the side lanes for a block or two on each side and allowing buses to “jump the queue” with signal prioritization would help reliability along the whole line: Lawrence, Irving Park, Armitage/Milwaukee, etc. I’m sure every Chicago bus rider has several such suggestions. My point is: when someone who has taken the auto-centric world we live in for granted says something like “traffic IS unavoidable” (as was literally said in the Curious City piece), we should know better. 56% of all Chicago transit rides (in 2013) take place on buses. It’s time for Chicagoans and other citizens of American cities to get over our attitude that we can never do anything that might mildly inconvenience drivers and remember that there are things we can do to improve the lot of the city’s bus service. Chicago’s plans for Bus Rapid Transit in the Loop and on Ashland are a start towards a goal of fair reallocation of finite available street space, but it’s the unsexy tweaks around the edges that will really juice the city’s transit network. It’s time to realize the choices we’ve made and continue to make, and to make better ones. Apologies for the long periods between posts. I’ve been caught up with school, work, and the Jewish holidays, so time for blogging has been infrequent. That being said, here’s a short post on something that caught my eye as I was doing research for a paper. Anyone interested in planning, economic, or transportation issues should be aware of a series of papers authored by Richard Voith, a former economic advisor to the Philadelphia Fed, Wharton School professor, and member of the SEPTA board. His writing covers topics like capitalization of transit access, urban-suburban real estate dynamics, and transit efficiencies. The last topic is the subject of a 1994 paper titled “Public transit: Realizing its potential,” published in the Philadelphia Fed Business Review. The paper is a general argument, but it also includes some interesting data on Philly transit systems circa 1994, which I thought it would be interesting to present here. As shown in the figure, PATCO’s fare is less than half of SEPTA’s. PATCO runs almost five times as many rush-hour trains on its single 14-mile line as SEPTA runs on its average commuter line. PATCO also runs much more frequent off-peak service. The net effect of the lower-price, higher-quality service is that PATCO carries over 10 times more people per mile of railroad than SEPTA does. [b] Thus, for very similar suburban markets and the same destination, ridership levels are dramatically different. The level of current SEPTA ridership doesn’t necessarily reflect transit’s potential. I see three possible contributing factors to the ridership differences. One, and likely the most powerful factor, is frequency. As Jarrett Walker has repeatedly stressed, frequency is the single best way to attract riders to a transit service. Another is the low fare, which was well below that of SEPTA. A third is that transit demand from South Jersey to Philly is relatively inelastic, because driving a car into the city requires paying a toll on one of only a few congested bridges. It’s possible that the low fare helped to attract riders to PATCO, and the pricing of car access to Philadelphia closer to true cost certainly helped the situation. But, especially accounting for the passes, SEPTA fares in Zone 2 were’t really that much higher than those of PATCO. I think it’s pretty clear that this data validates everything Jarrett Walker has ever said about frequency. In fact, ridership on PATCO was so high that had the agency been willing to raise fares $.89–$1.43 today, arguably a raise that a relatively wealthy suburban clientele could have afforded–it could have eliminated subsidies altogether. When you invest in frequent transit, you get what you pay for. Ridership follows investment in operations. We can argue about the necessity of subsidies; I’m guessing that the value to Philadelphia of keeping all of the cars used by PATCO commuters in 1994 out of Center City was far greater than the $.89/passenger subsidy. This is yet another argument for the rapid-transitization of the SEPTA Regional Rail network (and others! ), a case that has been made repeatedly by transit advocates and some professionals. Frequency is expensive in absolute and per-mile-of-rail terms, and probably unworkable without reworking of the labor agreements that American commuter rail systems currently operate under. But in terms of “buying” passengers, frequency is cheap–almost certainly cheaper than anything else transit agencies can do. I don’t want to shortchange the place that the bridge tolls hold in PATCO’s success; pairing realistic car pricing with high-quality transit is the future of American urban transportation policy. But driving into and parking in Center City is expensive regardless of where you’re coming from, and the success of PATCO’s high-frequency service is apparent. There are many, many places in the US where more-frequent regional rail service would be feasible; looking back 20 years, we can see the economic justification for what has become a popular idea among transit advocates.